Make your own cardboard creations! 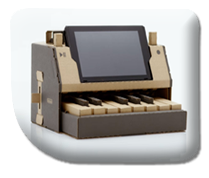 Nintendo Labo, the hotly anticipated "build your own" accessories that plan to educate and inspire today's youth has its own DIY mode! While in the initial Reveal Trailer there was a hint that there would be the ability to make your own cardboard experiments (the clip with the cardboard person falling over was a brief indication), Nintendo has just released a trailer showcasing what it's calling Toy-Con Garage. Toy-Con Garage is a stripped down version of the software that makes Nintendo's own Labo kits work, allowing anyone to use the drag-and-drop interface to allow you to assign sounds/events to the button presses or motions that you can perform with your Joy-Con. Nintendo Labo is just over a month away with the Variety and Robot kits releasing on 27th April. Children and adults everywhere are keen to see whether the DIY cardboard kits are as accurate as the promotional material make them out to be and whether they'll live up to the hype. Only time will tell. Join the conversation on Twitter or Facebook and let us know if you'll be it picking up on launch.